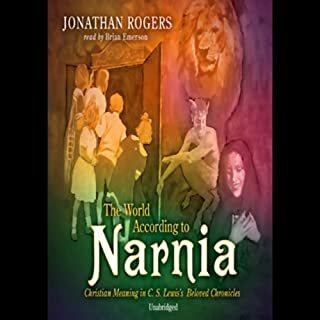 In The World According to Narnia, Jonathan Rogers takes you further into the imaginative world of C. S. Lewis, helping you to view our world in the way that Narnia invites you to view it. 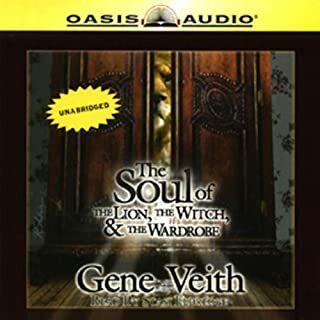 Rogers shows how the storylines and characters from Narnia sing with biblical truth. The White Witch, Aslan, fauns and talking beasts, centaurs and epic battles between good and evil: these have become a part of our collective imagination through the classic volumes of The Chronicles of Narnia. Yet who was the man who created this world? 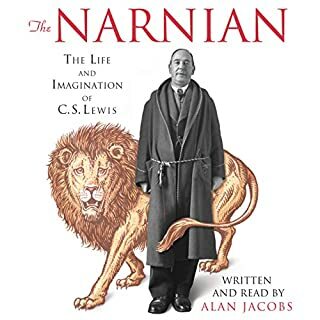 This audiobook attempts to unearth the making of the first Narnian, C. S. Lewis himself. The first book written by C.S. 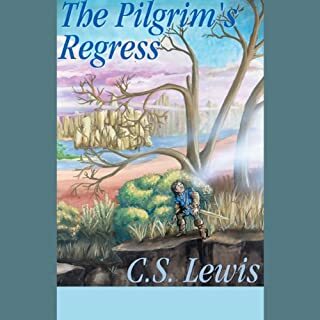 Lewis after his conversion, The Pilgrim's Regress is, in a sense, a record of Lewis's own search for meaning and spiritual satisfaction that eventually led him to Christianity. The Soul of The Lion, the Witch, and the Wardrobe will transport readers into the heart of the Chronicles of Narnia. Readers will discover that Narnia is more than just a magical place, it is a story reflective of the world we live in, our human condition, and our need for a Savior. Written in popular style for a broad audience of Christians and non-Christians, youthful and old, this book will answer the soul-stirring question of the movie and the novel. Out of the Silent Planet is the first novel of the Cosmic Trilogy, considered to be C.S. Lewis' chief contribution to the science fiction genre. 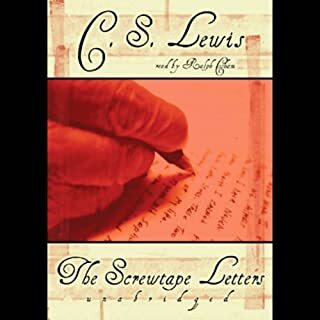 In this remarkable recording, C. S. Lewis shows why millions of readers have acclaimed him the greatest spokesman for Christianity in the 20th century. In a resonant, baritone voice, Lewis explores the nature of the four Greek words that are translated love in English: storge (affection), philia (friendship), eros (sexual or romantic love) and agape (selfless love). In Finding God in the Land of Narnia, best-selling authors Kurt Bruner and Jim Ware explore the deep spiritual themes of redemption and grace found in the popular Chronicles of Narnia series by C.S. Lewis. With amazing clarity that captures the tone and style of C.S. Lewis himself, the authors offer a depth of insight that will surprise even the most ardent Lewis fan. Each chapter will help readers gain not only a deeper understanding of the popular Lewis series, but of God himself. Johnny, a young apprentice silversmith, is caught with Otis, Hancock, and John and Samuel Adams in the exciting operations and subterfuges leading up to the Boston Tea Party and the Battle of Lexington. As Johnny is forced into the role of a full-grown man in the face of his new country's independence, he finds that his relations with those he loves changes for the better as well. Both astonishing and prophetic, The Abolition of Man remains one of C. S. Lewis's most controversial works. Lewis sets out to persuade his audience of the ongoing importance and relevance of universal objective values, such as courage and honor, and the foundational necessity of natural law. He also makes a cogent case that a retreat from these pillars of our educational system, even if in the name of "scientism", would be catastrophic. National Review lists it as number seven on their "100 Best Nonfiction Books of the 20th Century". For centuries Christians have been tormented by one question above all, "If God is good and all-powerful, why does he allow his creatures to suffer pain?" In one of his most enlightening works, C. S. Lewis shares his ruminations on both the form and the meaning of selected psalms. In the introduction he explains, "I write for the unlearned about things in which I am unlearned myself." Consequently, he takes on a tone of thoughtful collegiality as he writes on one of the Bible's most elusive books. Narnia...where anything can happen (and most often does) and where the adventure begins. This was the third book written in The Chronicles of Narnia. It now stands as the fifth book in the series. Don't miss any of the books in C.S. Lewis' classic Chronicles of Narnia series. ©1952, 1980 C.S. Lewis Pte. Ltd (P)2003 HarperCollins Publishers, Inc.
Reepicheep is not a cartoon mouse! 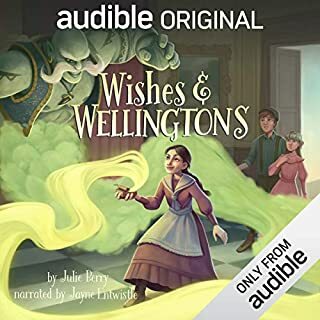 I was not a fan of this narrator because of Reepicheep. I didn't really care for him otherwise, but his voice for Reepicheep was very distracting. I know his voice is supposed to be shrill, but this was too much like the mice in the Three Blind Mouseketeers. It must be challenging to make a mouse voice that sounds dignified, but I believe it could have been done much better. The narrator in the last book did a better job. Derek Jacobi is one of the greatest actors of our time. His narration of this classic tale is absolutely brilliant. He brings this beautiful story to life like no other could. A great book for everyone! 🐕🐶 Great for road trips and long car rides. Great book. This is a good one, except for the voice of Reepicheep, which becomes painful at points. Too bad since he is such a central character! 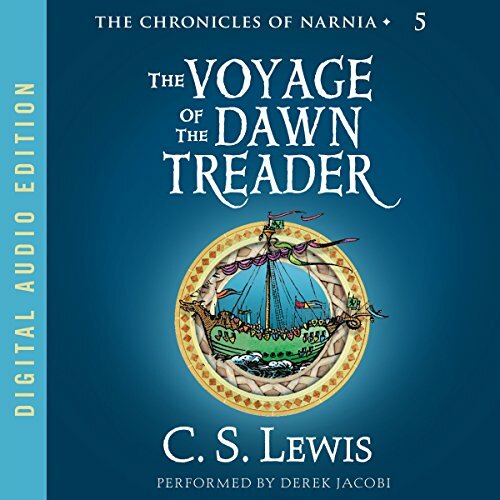 Would you listen to The Voyage of the Dawn Treader again? Why? I will listen to this book over and over and over for 2 main reasons: the first is the story. The Chronicles of Narnia are my favorite series, and no matter how many times I've read them they still speak to me. I love the allegory and find that they increase my faith in a new way each time. The second is DEREK JACOBI! How many times is it possible to listen to a Shakespearean actor read your FAVORITE novel? Can he please read more? I taught English IV for years, and have nearly all of Kenneth Branagh's Hamlet memorized from teaching it to so many students over the years. So listening to King Caudius' voice read The Voyage of the Dawntreader was really special. This was my favorite book out of all 7. I liked the shorter stories that went along with each adventure. I also liked how Eustace changes as the book goes on. The imagery Lewis creates is amazing, espcially toward the end. Join Reepicheep and the Children of Narnia on their adventures sailing to the utter east. I love the Chronicles of Narnia! this is one of my favorite books from The Chronicles of Narnia, the whole series is great. I have listened to these books down through the years many many times and I never get tired of them. the narrator was great made me feel like I was there. I highly recommend this series! I felt transported into Narnia. The narrator did an awesome job. The story is written well. It was as if I could smell, see, and taste all that was going on. I am thankful to have taken this journey to Narnia. Voyage of the Dawn Treader picks up presumably not long after thhe four Pevensies returned from Narnia at the end of Prince Caspian. While Peter goes to study with the famous Professor Kirk and Susan visits America with their parents, Edmund and Lucy are enduring an unpleasant stay with their disagreeable cousin Eustace Scrubb. Things get complicated whent he three children are suddenly sucked into a painting of a ship sailing one of the seven seas. They find themselves aboard the Dawn Treader, King Caspian's personal ship. Caspian reveals that he is on a quest to find sevenn Narnian lords banished during the reign of his tyranical uncle Miraz and return them to Narnia. While Edmund and Lucy are overjoyed to be back in Narnia, the pampered Eustace wants nothing more than to go back home. Will the crew of the Dawn Treader be able to complete their quest? And will Eustace drive them all crazy? This was an excellent production. Derek Jacobi does a good job of bringing the various characters to life. About my only complaint? is his portrayal of Reepicheep, but since he's a talking mouse... Needless to say I couldn't put this one down.